To park here you must display a mobility parking permit on your front window, otherwise you may be fined or have your vehicle towed away. 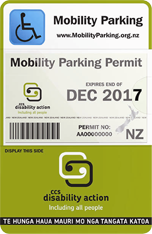 You can apply for a long- or short-term permit by contacting CCS Disability Action here. Long-term permits are valid for five years. Short-term permits are valid for 3-12 months and are for temporary medical conditions. A medical condition doesn't necessarily entitle you to a permit, though. There are criteria for eligibility such as the inability to walk distances without severe pain or breathlessness, or you have to use a mobility aid; the complete inability to walk; or for some conditions where you require physical contact or close supervision to safely get around.